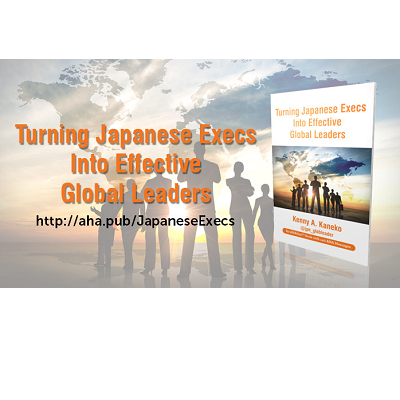 This week's five AHAs are from the AHAbook™ Turning Japanese Execs Into Effective Global Leaders. Please share this URL "aha.pub/JapaneseExecs" in your social media status update to let your friends know about it. Get your FREE copy here: http://getbook.at/JapaneseExecs. The role of a leader in companies, organizations, and associations is of vital importance. The success of a team is often measured by how organized the leader is. This book provides ways to stand out at the start of the leadership line. It explains issues that are happening every single day and redefines traditional leadership in the global world. Kenny Kaneko has been part of the leadership at several American Global IT companies for twenty years. He has built and run multinational groups with people coming from around ten different countries. Figure out the basic solutions today so you can get out of the infinite loop of failure! To see and learn how to automatically share AHAmessages from this book, you may check out this video: https://youtu.be/ag1O5tStFdk. To learn how to automatically share via AHAblaster, please watch: https://youtu.be/M_BuUufRXE8.